On October 7, 1955, Allen Ginsberg made the literary world sit up and listen to his “Howl.” It premiered at the Six Gallery in San Francisco, with Ginsberg doing a reading of the long poem. After Ginsberg’s “howl” (his answer to Walt Whitman’s “barbaric yawp”), the literary world would never be the same again. A few months later, in 1956, “Howl” was published along with other Ginsberg poems by Lawrence Ferlinghetti, who ran City Lights Bookstore. Truly, Allen Ginsberg was one of the great twentieth-century American poets, the literary heir to the nineteenth-century American bard Walt Whitman. Whitman and Ginsberg shared so much in common. The first edition of Whitman’s Leaves of Grass came out in 1855, precisely one hundred years before Ginsberg first read “Howl” in public. Leaves of Grass also had a rather notorious publication, and it, too, captured the attention of the literary establishment – in the person of Ralph Waldo Emerson, America’s most influential thinker and writer of the day. Like Whitman, Ginsberg favored the extremely long poetic line. Like Whitman, he could not be contained. Like Ginsberg, Whitman celebrated all Americans – from the prostitute to the President, including those from the nearly invisible underbelly of the United States. Whitman gloried in – sang the song of – laborers, immigrants, slaves, Native Americans, women, men, everyone. Like Ginsberg, Whitman was a gay man in a dangerous time to be gay, though Ginsberg’s Beat contemporaries were likely much more accepting of Ginsberg’s sexuality than Whitman’s peers were. But as Ginsberg knew, the world of the Beat Generation was relatively small, and he faced a larger America deeply hostile to and extremely fearful of homosexuality. But where Whitman celebrates Americans of every stripe, of every region, every race, both sexes, Ginsberg is howling, rending his clothes in anguish and despair. “I saw the best minds of my generation destroyed by madness, starving hysterical naked,” Ginsberg writes in the poem’s shocking opening. Where Whitman was strongly encouraged by Emerson to tone down the frank sexuality of Leaves of Grass and where Whitman was shunned by polite society for the graphic nature of his poetry, Ginsberg was actually taken to court on obscenity charges for “Howl.” It was fifty-nine years ago today that a judge finally ruled that the poem was not obscene. Of course, Whitman was not Ginsberg’s only influence. As you read “Howl,” you can pick up strains of Hebrew cadences, rhythms of Herman Melville’s epic voice, echoes of William Carlos Williams, inspirations from Jack Kerouac, and so much more. But Ginsberg was explicit more than once that he saw Whitman as one of his primary influences. Ginsberg’s 1955 poem “A Supermarket in California” pays homage to Whitman, as Ginsberg imagines walking the grocery store aisles with Whitman, whom he addresses as “dear father, graybeard, lonely old courage-teacher.” Particularly moving is the Voices and Visions episode on Walt Whitman, which features Allen Ginsberg discussing his poetic and personal debt to Whitman. If you don’t want to watch the video, you can read a transcript of Ginsberg’s comments at the Allen Ginsberg Project website. I’m proud to live in Boulder, Colorado, where Allen Ginsberg and Anne Waldman, another Beat poet, founded the Jack Kerouac School of Disembodied Poetics at Naropa University, the nation’s only accredited Buddhist-inspired university. The Jack Kerouac School adds to the literary liveliness of Boulder. Listen:Listen to Allen Ginsberg read “Howl.” The recording runs 20 minutes. 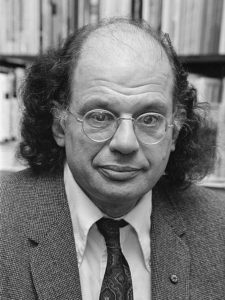 Image Credit: Allen Ginsberg in 1979, used with permission, https://commons.wikimedia.org/wiki/File:Allen_Ginsberg_1979_-_cropped.jpg.